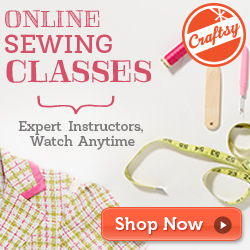 I had to let you know about this great Black Friday Sewing Class Sale by Craftsy. I love their on line classes. They are very professionally done. What I love about them is you can watch the classes when it is convenient for you. Another great feature is that you can bookmark places in the videos that you want to go back and review. So, stay at home and shop online for those friends and family members who love to sew! You can’t beat these Black Friday deals! Get up to 75% off craft supplies & project kits. Did I mention you could pick up an online craft class at $19.99 or less for yourself or someone else? What a unique gift for the holidays!